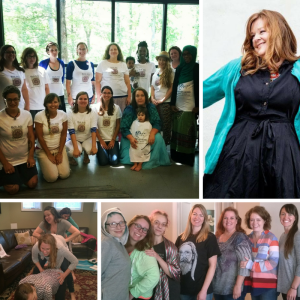 Become a Birth Arts International Certified Doula! Birth Arts International offers students an education, and an experience. We train students from all over the world. Our birth doula certification is the best in the world.he best doula certification. Download our "What will I learn?" resource. What can you expect from Birth Arts International? The best trainers in the world! Quick replies to emails and phone calls. Swift certified doula packet review. At your own pace, education. You work in a way that works for you. How many doulas have you trained? Over 25,000 doulas. Support, we've got it! We want to support you. We offer networking and mentor-ship for our certified doula students. Support comes from the director, trainers and other students. We offer groups, email, phone and personalized support. We want to be connected to you. Our certified doula students know they can contact the Director with any questions. Guess what? We also teach you how to run a profitable certified doula business. Learn real business skills from a truly exceptional business-woman. Extra Fees? Nope. There have never been any hidden fees, none. No fees for certification, grading homework, maintaining certified doula status. Certified Doula. How to be a successful certified doula. Support and client care skills. The most well-rounded doula training. We train you to support your community. The most modern certified doula education. Strong ethical and cultural education. Leadership that listens and supports you. Networking and community building skills. We treat our students as professionals. Students are encouraged to work in a variety of care settings. This can be a private childbirth education class or hospital based program. We require this so you know what women in your area are receiving as childbirth education. Hour requirement is 4-8 hours, or what you can find in your community. Read the required books from the book list. We require a few more books than most certifying bodies because we feel it is essential to view birth with an open mind and an educated mind. Reading two to three more books can assist in doing this but it also exposes students to different viewpoints and perceptions of the birth process. You will find the Birth Arts International workbook like no other doula training workbook. You will do assignments that look into your heart and challenge you mind and perceptions of birth and labor support. We want students to fully process and achieve their maximum potential. Assignments will challenge your views of birth, yourself and the work you will be doing. We require the documentation of attendance at 5 births. These births can be homebirths, birth center births, hospital births and C-section births. Doulas are trained to be successful practitioners, and to work in a variety of environments and with a cross section of care providers. What can Birth Arts International Offer You? Pricing: We work to keep prices low. No certification or grading fees. Educational Materials: In depth student workbook. Online classroom access. Up to date resources and materials. Online Resources: We use the same software for our classroom as universities. You will find audio, video, PowerPoints to improve your skills. We also have student only Q&A sessions and a student group. No Hidden Fees: When you enroll in our programs the fee you pay is all we charge. We don't require that your become a member or pay fees to stay certified. Some organizations have exam fees, certification fees, membership fees and newsletter fees. Our tuition covers all of that, and you pay it once, when you enroll. Support: You get the best support. Join our Facebook group, this group and get support, community and ideas to make your work better. We also offer email support and phone support. Students can call us during office hours or make an appointment for additional educational, professional and business support. In addition, you will be treated respectfully and professionally in all of our student groups. Bonuses: These can be webinars, uploads to the classroom, audio files and so much more. Newsletter: Join our newsletter for articles, information and business tips. Access to your program Director: All student emails, and calls for support are personally answered by the program director. Why are we set up this way? 1. Get you answers when you need them. 2. You get the support when you need it. 3. Sometimes you need emotional support and the director will work with you. What do you require for certification? How to become a doula? 1. Complete the reading list. 3. Complete the activities in the student workbook. 4. Complete business and professional activities. How long does it take to complete the program? All programs are at your own pace. Most students take about 4-8 months to complete the program. If you need a break or take longer that is fine. Being a doula is rewarding, a great career path and benefits your community. Do you have an SOP? Yes, we do. Ours respects our student’s autonomy and professionalism. Do you have other classes we can take to compliment our practice? Yes, we do. We offer Postpartum Doula Certification, Childbirth Educator Certification, Aromatherapy for Pregnancy, Birth and Postpartum and many other courses to assist you in giving your practice an edge. How else do you connect with students? We have a Facebook page, student only Facebook groups, email list, newsletter, Instagram, Pinterest and Twitter. Access to eLearning after your in person class. Instant access to materials in our online classroom. All of your educational materials are online and you can work wherever you have internet. Interactive classroom and student connections online. Access to eLearning Classroom and other students. Unlike other doula certification organizations, Birth Arts International has no additional fees. Your enrollment fee is the only fee we will charge you. We do not have certification, membership or examination fees that are due to become certified or to keep your membership current for our childbirth doulas or any other practitioners. All enrollments are final and non-transferable.